UTV and ATV Sprayer Buyer's Guide. An ATV sprayer is a great accessory when you need to cover a large enough area that you would prefer riding to walking. They're also good for areas that are too small and tight for larger, tractor or trailer mounted equipment. 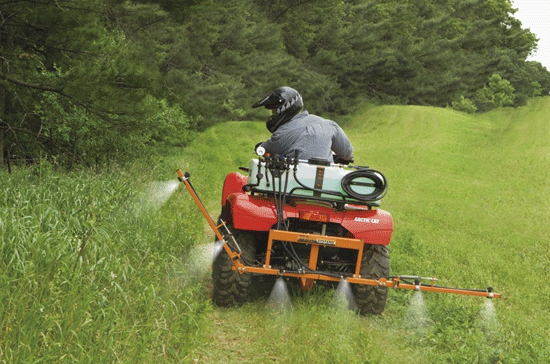 Our Buyer's Guide will detail the major differences in the several ATV sprayers available. 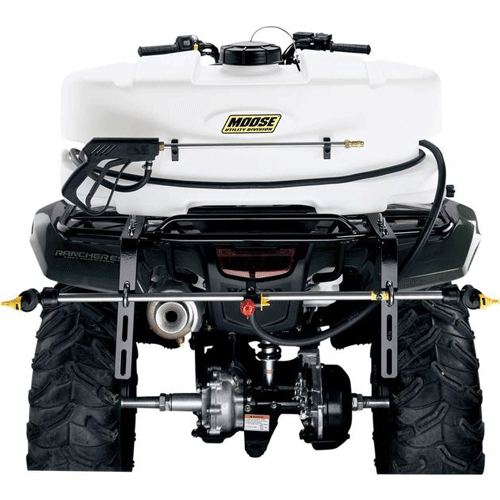 Size, capacity, and weight are also major factors in choosing the best sprayer system for your four wheeler. We'll include some recommendations to help you make the best choice for the ATV you have. Want to shop first? Use the link below. 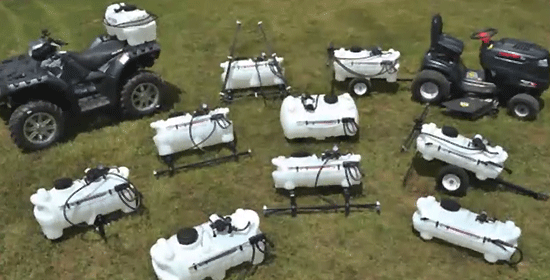 Sprayer systems for ATVs come in several shapes and sizes. 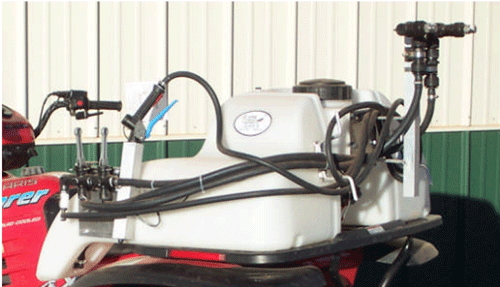 Main Types of ATV Sprayer Systems. All ATV sprayers consist of a tank to hold the liquid being applied, a pump to deliver the liquid to the spray nozzle or nozzles, some sort of control to regulate the flow, and an arrangement of spray nozzles to deliver the material. Most will include a hose with handgun for spot spraying. Now, let's get into the two major differences. An ATV system with a series of nozzles installed on a bar that extends past the width of the ATV is called a boom type sprayer. A boom system is designed to cover a larger area in less time or fewer passes. Boom sprayers cover a large area with fewer passes. They're best for open areas with few obstacles to interfere with the passage of the wider spray bar. Some systems do have a hinged boom that can be folded to allow passage through narrower openings. A few other four wheeler sprayer models expand on the folding boom principle to allow the user to position each side of the boom at an angle for even wider coverage. It also makes it possible to spray in a more vertical direction for better coverage of higher areas. Boom systems with hinged sections increase versatility. Boom type systems tend to have larger tanks and more powerful pumps due to the higher capacity of multiple nozzles on the boom. Many of the models also offer optional spray nozzles for different situations and spray patterns. Another favorite feature to look for are controls that are mounted within easy reach while seated on the ATV. It gets old fast if you're having to jump on and off to change settings on the sprayer system. Controls mounted within easy reach of the seat are a plus. Boomless sprayer with short spray bar. A boomless ATV sprayer system can be one with a single spray nozzle, all the way up to one with multiple nozzles on a short bar that does not extend further than the width of the ATV. The are generally smaller, lighter, and less expensive than the boom type. For may folks without the need to cover large areas frequently, they will be more than adequate. Smaller boomless system with dual spray nozzles. For smaller ATVs with limited rear rack capacities, a boomless system with a smaller tank may be the only option. At around eight pounds per gallon for water, even a 25 gallon tank will weigh over 200 pounds total. Safety - There are a few safety consideration when using a sprayer system. When tanks are full they tend to be very heavy, A 25 gallon tank can weigh over 200 pounds. Since they are usually strapped to the rear rack of the ATV, the higher center of gravity and extra weight in the rear, can change the handling drastically. The higher center of gravity will make the ATV much more prone to tipping over when turning or riding on sloped terrain. The extra weight in the rear can lighten steering and make it more difficult to control the ATV in turns. The constantly shifting weight of the liquid in the tank can give an unpredictable "feel" to the handling. Due to the weight of the tank, whatever type of mounting system that's used needs to be very secure. There should be no movement of the tank at all, because any looseness will increase instability even more. Best ATVs for Boom Systems - Since these sprayer systems tend to be larger, heavier, and more cumbersome, we would recommend a larger ATV be used with them. Most of the 500 or larger ATVs will be fine, as long as they have at least a 400 pound rack capacity. Any UTV should be large enough to safely mount a boom type system. 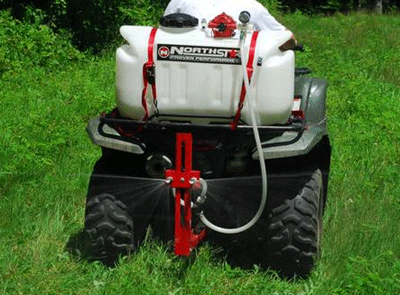 The larger the ATV or UTV, the better able it will be to handle the extra weight of a sprayer system. Any changes in handling will be less noticeable with the larger machines. Best ATVs for Boomless Systems - Since these ATV sprayer systems are best suited for smaller and tighter spaces, a smaller and more maneuverable ATV is recommended. Tank weight still has to be considered, so make sure the rack capacity of your ATV is suitable. Smaller ATVs will be affected more by the extra weight since they tend to have shorter and narrower wheelbases than larger models. If you'll be on sloped or uneven terrain, we would recommend the smallest tank you can live with for best handling. No matter which sprayer system you choose, you'll find your spraying chores are a whole lot easier! If you're ready to do some shopping, just check out the link below for some of the best deals online.